"...in recognition of his groundbreaking collection of rigorous mathematical descriptions of polarization that are used widely to interpret experimental data. His work in polarization optics is a pivotal collection of contributions that form part of the underpinnings of modern polarimetry. Professor Gil has also made important early contributions to experimental polarimetry through the design of Mueller polarimeters. 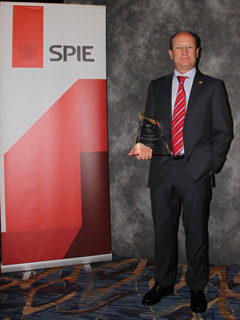 A strong experimental awareness has led to his rigorous and groundbreaking theoretical work being readily used in numerous polarization applications..."
My deep gratitude to the SPIE Awards Committee and all colleagues around the world who supported this nomination! Eusebio Bernabéu, Petra María Arnal, José Manuel Correas, Jesús Delso, Pedro Melero, Chelo Ferreira, Rafael Navarro Belsué, Razvigor Ossikovski, Enric García Caurel, Shane Cloude.